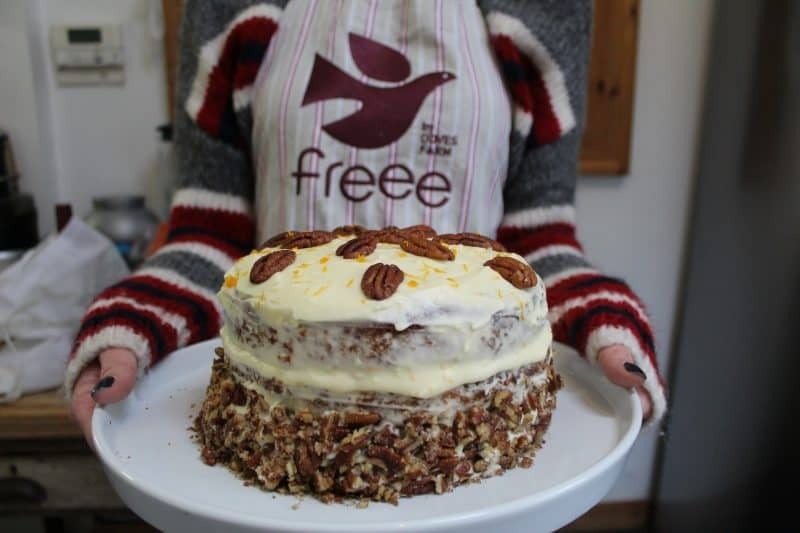 I’ve had a lot of requests for a gluten free hummingbird cake recipe, so when FREEE by Doves Farm asked me to create a showstopper cake for their 40th birthday, I knew this was the one! 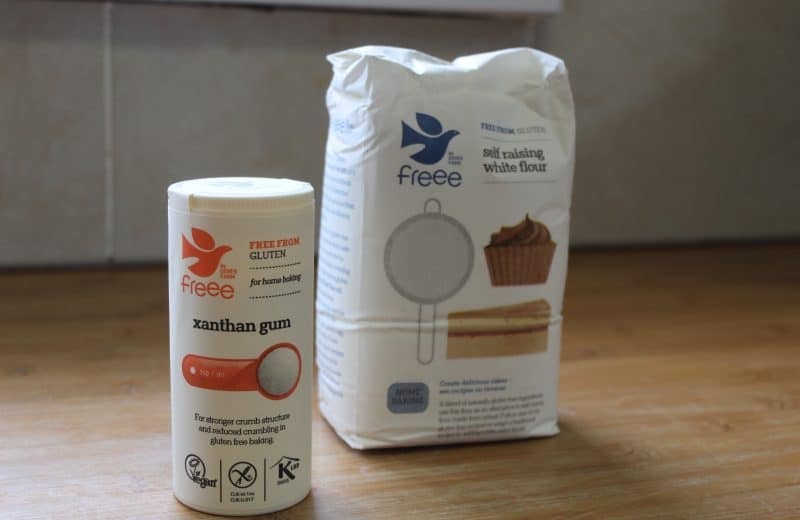 I nearly always use FREEE by Doves Farm in my gluten free baking, and it’s a brand that’s been with me through all of my coeliac disease journey. I even did a cooking demo with them at the Allergy and Free From Show this year making my gluten free chicken katsu curry! It’s one of my favourite brands and I felt honoured to be asked to work with them to create a gluten free showstopper! And what a showstopper this gluten free hummingbird cake was! Three layers of fruity, tropical-tasting sponge with crunchy pecans and a sweet pineapple and orange icing. This was a delight to put together and even more of a delight to eat! Because of the fruit, the hummingbird cake is so – dare I say it – moist, and it helps it keep for longer once cut. 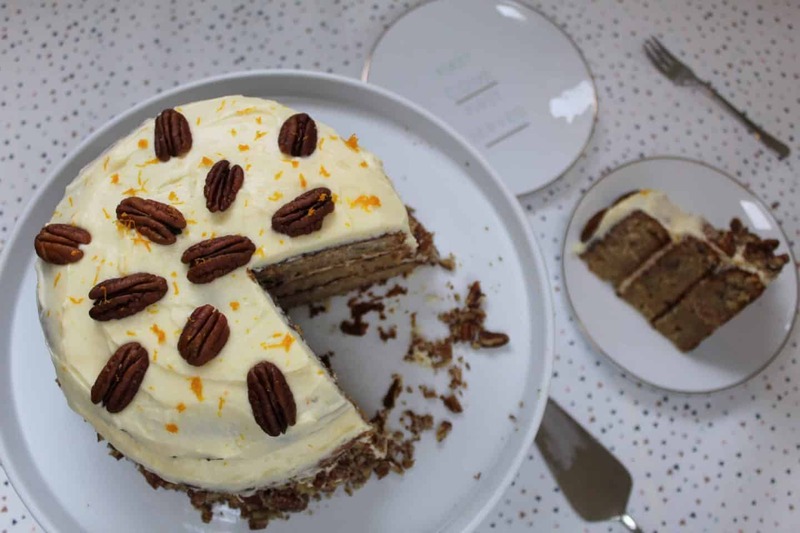 In this gluten free hummingbird cake is a medley of ripe bananas, pineapple crush and passionfruit pulp. You could use pineapple pieces if you prefer, but I liked the texture and flavour the pineapple crush gives the cake. For the cream cheese buttercream, I put my own twist on this gluten free hummingbird cake by using some of the pineapple juice, as well as orange zest. This helped to balance out the sweetness a little! 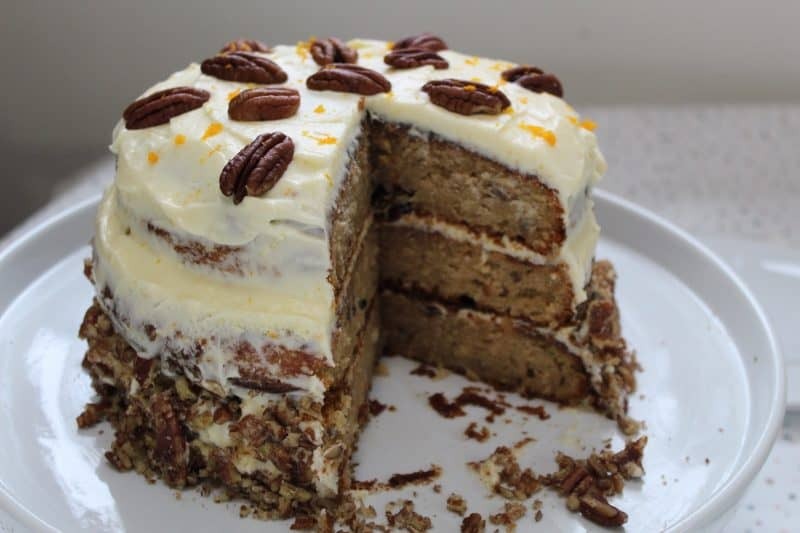 For my gluten free hummingbird cake, I used the FREEE by Doves Farm Gluten Free White Self Raising Flour and the FREEE by Doves Farm Xantham Gum. I like using self raising flour in cakes because it saves me guessing the right amount of baking powder. I always use xantham gum in my baking, ever since I did a cookery class with Bake Off’s Howard Middleton. He explained how it helps with the texture of a gluten free cake, and I always find it gets a much better result. A little goes a long way! People always comment when I use it they couldn’t tell the cake was gluten free, so it’s definitely one of my baking staples. I think what I love about FREEE by Doves Farm, and the reason they have been going for so long, is that they really seem to just get gluten free baking. Established by Michael and Clare Marriage in 1978, Doves Farm Foods is an award-winning, British family-owned organic and gluten free flour and food producer which is regarded as a pioneer in organic, ethical and sustainable farming and food production. They have loads of fantastic recipes on their website and they have every product and type of gluten free flour you could need! Everything in the FREEE by Doves Farm range is rigorously tested to ensure it’s gluten free, and it’s all clearly labelled so you can easily find the gluten free product you’re after. Also, 90 per cent of their products are dairy free and vegan too, which means everyone can enjoy them! To celebrate their birthday, FREEE by Doves Farm are holding a competition and they want to see your gluten free birthday cakes! You could win a whole host of goodies – share a snap of a great gluten free birthday cake you’ve made and be in with the chance of winning an overnight luxury stay with gluten free afternoon tea and dinner. They’re also offering a discount on their website to celebrate their 40th birthday until October 21. Stock up! 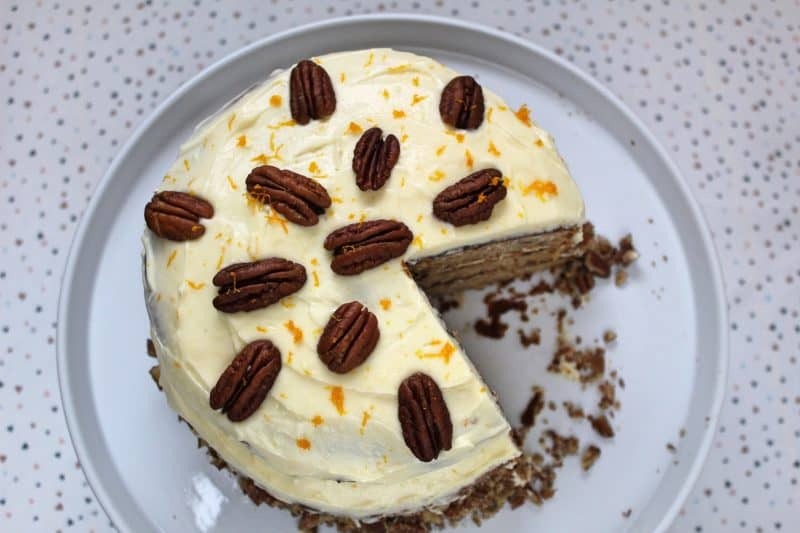 And if you don’t fancy making up your own recipe, have a go at my showstopper instead and give my gluten free hummingbird cake recipe a go! 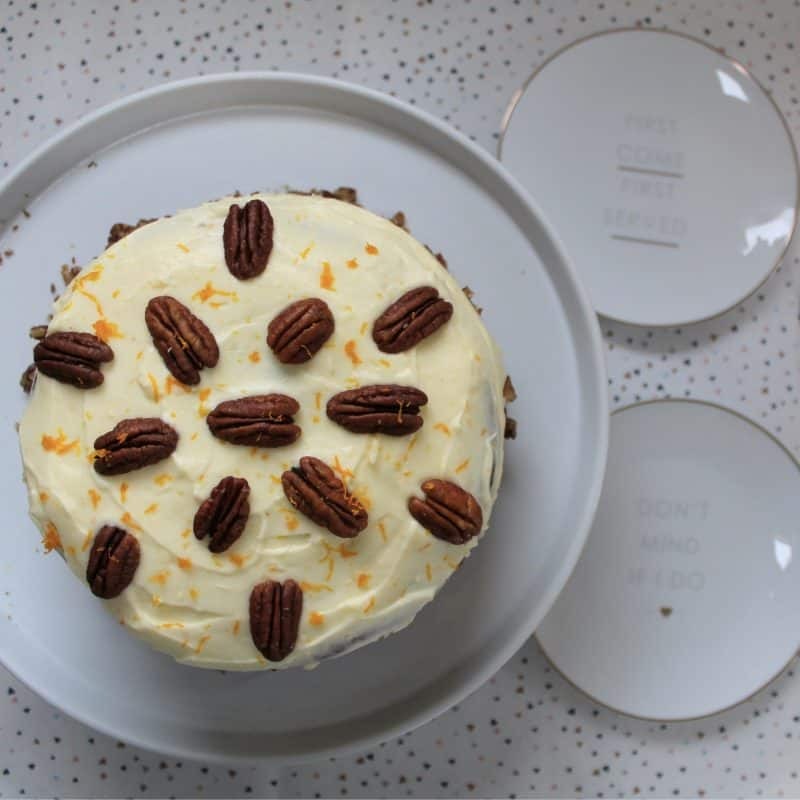 This gluten free hummingbird cake incorporates bananas, pineapple and passionfruit with a zesty pineapple and orange cream cheese frosting and pecan topping. Preheat the oven to 180'C/Gas 4. Grease and line two 20cm diameter baking tins and set aside. Add the flour, xantham gum, cinnamon and sugar to a large mixing bowl and stir with a wooden spoon until combined. Next add the eggs, oil, pineapple, banana and passion fruit to the flour mixture and beat until combined. Add the chopped pecan nuts and stir through. Separate the mixture between the three cake tins (it should be approx 510g of mix per tin) and bake in the centre of the oven - see notes. Once cook, remove from the oven and cool on a wire rack. Once all of the cakes are completely cool, make the frosting by beating all of the ingredients in a large bowl until smooth. Assemble the cake by placing one sponge on top of the other, sandwiching and then topping with the frosting. I used a spatula to spread frosting around the sides of the cakes too, and then decorate as you wish with pecans and some extra orange zest. You might need to bake the cakes in batches if you have a small oven like me. You don't want to keep opening the door to rotate shelves otherwise your cakes might sink! If you want to have a go at some of the other recipes I’ve made with FREEE by Dove’s Farm flour, check out some of these too! This post is sponsored by FREEE by Dove's Farm. I sometimes accept sponsored posts with brands I love and trust, but my opinions are always my own.